People install retractable awnings for a variety of reasons. Here are the top ten that may help you decide if updating your home or business with a retractable awning is the right choice for you. 1. The most obvious reason that people install shade systems retractable covers is for protection from the sun. They provide shade for patios, decks, porches, and business entrances. These awnings also block harmful UV rays, so you really are protected from the sun. If you would like to see an example of this, you can view some of the many cassette awning pictures that are available. 2. Retractable awnings are also used to expand a home’s usable space. There’s no point in having a deck or patio if it’s always too hot for you to use it. Although regular awnings can do the trick, an exterior zipper shade can really define your outdoor space in addition to expanding it. You can use an exterior zipper shade to enclose your deck or porch, creating an entirely new room for you to use and enjoy. 3. If you want more than protection from the sun, a retractable awning can provide that as well. They’re great for all weather, protecting you from wind, rain, and snow. 4. They can help you save energy and lower your cooling bill by reducing heat gain in your home. Heat gain can sometimes be reduced up to 70 percent when you install an awning. This means that you won’t have to run an air conditioner or fan as high or as long, which saves you money in the long run. 5. Awnings can actually add to the look of your home or business. There are hundreds of colors and numerous styles when it comes to awnings, so it’s like giving your home a mini makeover. 6. Ease of use is another reason that people install awnings. There are no large, heavy umbrellas to stick inside little holes in some table. There isn’t a crank that has to be turned. All you have to do is press a button, and your awning extends and retracts with ease. 7. 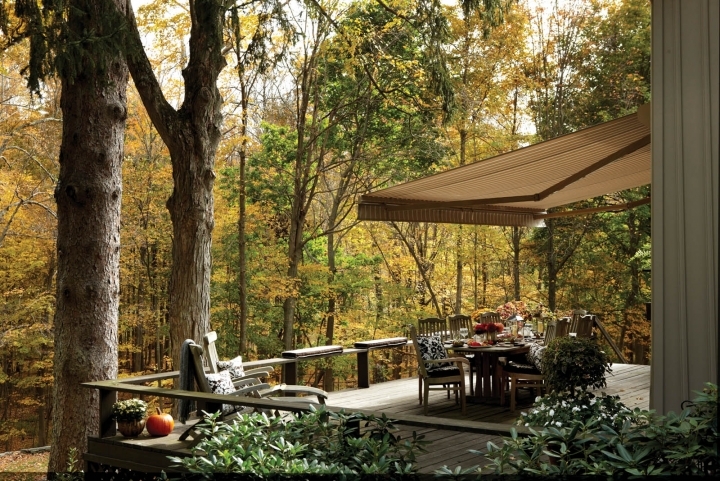 Shade systems retractable covers provide a personal oasis in your own yard. You can entertain guests or simply relax and enjoy the day. Meaning you don’t have to actually go anywhere to have your own mini vacation. 8. Awnings protect your outdoor furniture from the element so you won’t have to replace them as often. 9. Installing an awning can make entertaining easier. It provides you with an open space where your guests can mingle and relax in comfort. It also means that you can move the party outside, leaving the inside of your home free from party clutter. If you take a look at a few cassette awning pictures, you’ll notice the enormous amount of coverage that an awning can provide for a space, so your party can be an intimate affair or a big blowout bash in the shade, it’s up to you. 10. Awnings help you control the weather. Well, not literally, but they help you to control how you experience it. If you want to make a hot day cooler, simply extend it. If you want more sun on a cool day, retract it. If you want to sit outside, but it’s raining, that’s not a problem either. Your weather can be whatever you want it to be.